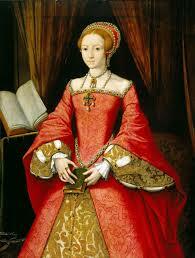 Elizabeth I When a Princess, depicts Elizabeth Tudor at the age of thirteen or fourteen. Likenesses of the princess are rare. “There are probably only two surviving solo portraits of Elizabeth before her coronation in 1558” (Mukherjee). This blogger was lucky enough to see this painting in the Queen’s Withdrawing Chamber at Windsor Castle in 1997, and during the Elizabeth I Exhibit at the National Maritime Museum at Greenwich on August 8, 2003. Interestingly, Freeman O’Donoghue wrote in 1894 that this painting was from the School of Holbein and he claimed that it “was formerly at Hampton Court and later at St. James’s Palace.” He identified it as “No. 247 of the 1866 National Portrait Exhibition” (O’Donoghue 1). Princess Elizabeth at 14 attributed to Gilliam Scrots, 1546-1547. Owned by The Royal Collection Trust, art historians disagree about the identity of the painter and date but do agree with art historian and critic, William Gaunt, who described the artist as ‘unknown’ and the artwork itself “in a competently Flemish style” (Gaunt 37). Dendrochronological research places the painting, along with one of Edward VI as Prince of Wales, to 1546-1547 (“Building the Brand: Elizabeth I When a Princess”). It has been suggested that “the painter of these two works was Guillim Scrots, an artist from the Netherlands who was employed by Henry VIII from 1545…” (“Elizabeth I When a Princess”). The sophisticated style and the period add to the evidence it was Scrots. Guillim Scrots had been appointed as Court painter to the Habsburg ruler, Mary of Hungary, regent of the Netherlands at Brussels. By late 1545, Scrots was working for Henry VIII “as King’s Painter with the annual salary of £62 10s*, which was much higher than any painter of the Household had received before” (Waterhouse 24). After Henry’s death, Edward VI retained Scrots at the same salary ensuring the services of a highly qualified artist. In the words of art historian Ellis Waterhouse, “although Scrots was not a painter of high creative or imaginative gifts, he knew all the latest fashions” (Waterhouse 24). The work shows “in fact the elegance and distinction of which he was capable when his own execution was involved and he was not simply turning out studio replicas to order” (Waterhouse 24). Scrot’s specialty seems “to have been the full-length standing portrait, which he probably introduced into England…” (Waterhouse 25). Because this example is of three-quarters length, and since it is “not easy to establish Scrots’s oevre,” this work “may be by another –at present unidentified – highly trained émigré artist” (Doran “Elizabeth: The Exhibition at the National Maritime Museum” 17). The intricate detail of the dress and accessories shows not only technical skill it “is a good example of the type of work carried out by a painter who had all the clothes and jewels in front of him, properly mounted, to complete the work” (Arnold Queen Elizabeth’s Wardrobe Unlock’d 19). As the official King’s painter, Scrots would have had ready access to the Princess to pose for him and her selected attire. An important question emerges from the accessibility of the Princess: who commissioned this work? Was it Henry VIII or Elizabeth herself? Most historians believe Henry VIII gave the directive for the painting as a companion piece to the one of Edward, Prince of Wales. We know “from the study of the tree-rings, that the two portraits at Windsor of ‘Edward VI as Prince of Wales’ and ‘Princess Elizabeth’ are the product of the same workshop and can be dated to 1546/47” (Waterhouse 25). Oliver Millar, a British art historian, “has pointed out the technical similarities to the portrait of Edward as Prince of Wales” (Hearn 78). Edward VI as Prince of Wales attributed to Gilliam Scrots, 1546-1547. Linking the two works to the same artist is pretty well proven; what muddies the water is a later inscription on the painting. In Latin it reads “Elizabetha/(?Filia) Rex/Angliae” (Arnold “The ‘Pictur’ of Elizabeth I When Princess” 303) which translates to “Elizabeth, daughter of the King of England” (Doran Elizabeth: The Exhibition at the National Maritime Museum 17). What it may have said originally was “Soror” (Arnold “The ‘Pictur’ of Elizabeth I When Princess” 303). Soror is Latin for sister, which would be appropriate if Elizabeth had commissioned the painting for her brother Edward. In the portrait, “Elizabeth is shown as a king’s daughter, richly attired and wearing jewellery appropriate to this status” (Doran “Elizabeth: The Exhibition at the National Maritime Museum” 17). Could this not also be the attire of a king’s sister? If the painting was commissioned in 1547, it would certainly be the instigation of Elizabeth as we know by a surviving letter she sent to Edward that she sat for a portrait for him (more on that later). Unfortunately, the exact year of the letter is not proven and the painting is not described. What is known is that in the inventory for King Edward completed in September 1547, an entry described a portrait as follows: “A Table of the Ladye Elizabeth, her Grace, with a booke in her hande her gowne like crymsen cloth of golde, with woorkes” (Norris 287). Obviously this does not prove that Elizabeth commissioned the painting in 1547 (Henry died in January of 1547), in fact, it could be as logical that this was an inventory taken of Henry VIII’s possessions which Edward inherited. Elizabeth I When a Princess could have been produced upon the same contract because it “would be reasonable to expect that one of the first things Henry VIII would require of Scrots would be portraits of Prince Edward and of Princess Elizabeth” (Waterhouse 24). An examination of the clothing and props does not clear up the issue of whether this was commissioned by Henry VIII or Elizabeth. The rich gown and jewelry could have been Christmas or New Years gifts from Henry, or Elizabeth could be wearing “apparel that she wore for her brother’s coronation” (Frye 50). “Elizabeth would have worn mourning black for a few weeks, but Edward VI’s coronation was on 20th February 1547 and by March she would no doubt have been ready to wear her best gown for a portrait to please her brother” (Arnold “The ‘Pictur’ of Elizabeth I When Princess” 303). What is interesting to note is the entry for the Privy Council in April of 1547 which authorized the payment of considerable sums for clothing on behalf of Elizabeth. Surviving records are informative as “gifts of clothing are therefore unusual enough to be remarked on in the records” (Frye 51). The pertinent Act of the Privy Council reads in part: “for a bille due to my Lady Elisabetes taylour, xxxv ix vij [25 pounds 10 shillings 7 pence]; for a bill of her embroderers, xlj v [41 pounds 5 shillings]; for a bille of her robes, lxxiij xij iiij [73 pounds 12 shillings 4 pence]; for her skynners bille, xxv v iij [25 pounds 5 shillings 3 pence]; for a bille of her cofermakers, xv xv iij [25 pounds 25 shillings 3 pence]” (Dasent 86). We cannot be sure that these were bills paid for clothing for her time of mourning and/or for the attire for her brother’s coronation. What is clear is that in the painting, Elizabeth I When a Princess, Elizabeth is clothed in expensive, elaborate garments. Does this prove she commissioned the work as a gift to her brother? Most sources concede that this “may have been the painting which she sent to her half-brother Edward” while denying that this was the portrait that accompanies the letter to the young king (Watkins 20). Susan Frye believes without question that the painting at Windsor “was almost assuredly a gift to her brother” after his ascension to the throne (Frye 49). This gift “sought to affirm and strengthen a bond between herself and her brother with the implied hope that she would not only retain his favour but be invited physically to the court, where she might at least have a chance to influence decisions concerning her allowance, her education, her housing and her future husband” (Frye 49-50). Frye maintains that Elizabeth commissioned this painting herself as a gift for her brother, King Edward VI. “Gift giving at the Renaisance Court was a highly symbolic act” (Frye 46). Elizabeth became a master at presenting tokens “as the author not of her own destiny, as earlier historians might have it, but as the author of the negotiations of her always-changing political position” (Frye 44). Examples would be the translations of Katherine Parr’s works for her father, the embroidered books for Katherine herself and the painting for her brother: “the responsibility for a thoughtful and imaginative gift lay with its giver” (Frye 46). Gifts were selected with care as they were “a painstakingly considered form of self-representation. The gift connected giver and recipient by making a statement about their shared relation to larger groups and networks, while the point of the gift was to create a bond through what the gift said about the power of the recipient and the submission of the giver” (Frye 46). 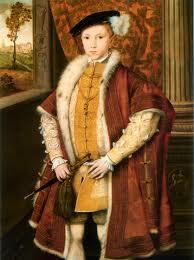 In the historical context, it is important to keep in mind that King Edward VI was a minor. His father’s will and the actions of the Council made Edward Seymour his Lord Protector. Elizabeth’s influence would have to work directly on the King as others truly governed him. Returning to the point of Elizabeth sending her brother a portrait, there is also the consideration of the letter, written 15 May, which accompanied it. Remember there is no proof that this was the letter written in 1547 and this was the picture sent at the same time; it is only speculation as many experts, such as Mueller and Marcus, date the letter to 1549. 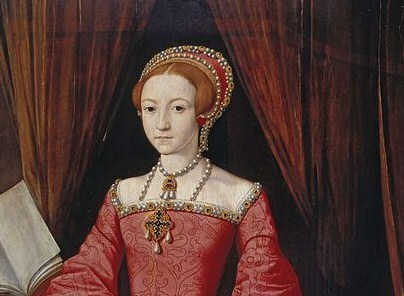 “Unfortunately the letter gives no details of the clothes that Elizabeth wore for the ‘pictur’ but, until a miniature or another portrait of her painted at this time is discovered, it may be conjectured that this is the portrait she sent to Edward” (Arnold “The ‘Pictur’ of Elizabeth I When Princess” 304). The letter was written for public viewing and has been described by those who have seen it as elegant and ornamental. “Elizabeth has artfully constructed the letter to shape the response of her brother as audience of his sister and her portrait” (Frye 54). Frye makes an interesting point that Elizabeth’s letter, along with the portrait, was used by the Princess to reflect her “dignity and intelligence” and influence the King’s perception of her (Frye 50). Elizabeth wrote, “For the face, I graunt, I might wel blusche to offer, but the mynde I shal never be ashamed to present” (Nicholas “Childhood and Early Years of Princess Elizabeth” 46). The Elizabeth “in prose, like the Elizabeth in paint, asks us to read her image with a care for what is going on inside her mind, and to use her physical presence in the picture and in her ‘hand’ as the means to come to know that mind” (Frye 54). The Princess implored her brother, “whan you shal loke on my pictur you wil witsafe to thinke that as you have but the outwarde shadow of the body afore you, so my inwarde minde wischeth that the body it selfe wer oftner in your presence…” (Nicholas “Childhood and Early Years of Princess Elizabeth” 47). Strengthening her relationship with her brother, Elizabeth presented visually her position in the family, showing herself as a close female relative to a king with her rich dress and jewels, and in writing she reminds Edward of their shared history and her desire to see him—to reiterate her connection with the monarchy. Elizabeth started her letter, written from Hatfield, telling her brother how much it meant to her that he had requested a portrait of her. In flowery prose she declared herself “like as the richeman that dayly gathereth riches to riches,” her ‘riches’ now increase with Edward “askinge and desiring … requiring a thinge not worthy the desiringe for it selfe, but made worthy of your higthnes request” (Mueller 24). While Elizabeth demurely expressed her reluctance to have her portrait done, she repeatedly stressed her own intelligence: “For thogh from the grace of the pictur the coulers may fade by time, may give by wether may be spotted by chance, yet the other [her mind] nor time with her winges shal overtake, nor the mistie cloudes with her loweringes may darken, nor chance with her slipery fote may overthrow” (Hearn 78). 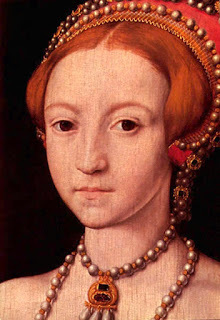 Elizabeth I When a Princess, shows Elizabeth in her early teens, “demure, pale complexioned with light auburn hair and a thoughtful, …expression” (Brimacombe 5). Yet, Elizabeth wanted her brother and all viewers to look her beyond the superficial aspect of the portrait to see her intelligence, her role in the Tudor dynasty, and her position at Court. “The letter’s attempt to structure the response to her gift is the most dramatic early instance of Elizabeth’s awareness of both the limitations and potential of her portraiture” (Frye 57). Elizabeth I When a Princess, one of the few depictions of Elizabeth before her accession, “conveys her beauty, dignity, gentleness and learning” (“Elizabeth I When a Princess”). Placed as she is between two books, the viewer must ‘read’ the portrait. The books, added to her gaze, direct and firm (This blogger must disagree with one word used to describe Elizabeth in the description immediately above –-gentleness— she appears too authoritative to be gentle, perhaps youthful would be a better word) show her unmistakable intelligence. We have interrupted her studies. She has her left hand holding the place in her book (probably a religious text in Greek or Latin as she famously excelled in knowing) and even a small bookmark. The larger book on the podium, although blank, most certainly represents the Old Testament. The Princess “had a full Renaissance education, was proud of it, and wanted it known” (Knight). Enlargement of Elizabeth’s hands holding a book and her costume. Interestingly, the books “imply rather than seek to enforce Elizabeth’s religiosity” (Frye 53). We certainly are clued into the ‘inwarde minde’ Elizabeth mentioned in the letter to her brother. This religious quality is expressed in “the simplicity of the princess’ pose and enriched by the inclusion of the two books” (“Elizabeth I When a Princess”). The princess was “concerned with more than the ostentatious display of material possessions.” The books “indicate that her interests were both religious and scholarly” (Watkins 20). Roy Strong maintained in his text, The Cult of Elizabeth, the “strength of Elizabethan image, lay in its capacity to be read and re-read many ways….” (Mudd 22-23). Elizabeth I When a Princess, provides a case for such a theory. We will never know the extent of Princess Elizabeth’s influence on the arrangement of the portrait under discussion here. Regardless whether she cajoled the artist or they were both swayed by the conventions of the time, alterations now detected in the thinning paint, reveal considerable changes made to the work during its creation. 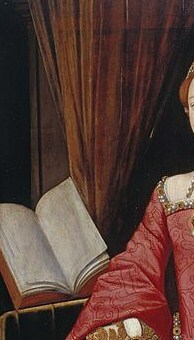 The fingers of Elizabeth’s right hand and the position of the book she holds have been modified as was the wall above and behind the large book. Apparently the curtain was painted over a wall with “elegant architectural features” (Doran “Elizabeth: The Exhibition at the National Maritime Museum” 17). Behind Elizabeth’s left shoulder, the curtain was painted over “architectural features incorporating carved rams’ heads.” Further, along the defunct wall, “moulding which formerly continued above her head into a recess curving to the right” was painted over (Hearn 78-79). Enlargement of the book in the background and the curtain. Enlargement of the curtain and the arch. Providing a suitable setting for the “earliest single-figure image of the future Elizabeth I,” the background frames the subject herself (“Henry VIII at Windsor Castle” 3). Meticulously painted, the richness of the fabric in the gown worn by the Princess is shown “in minute detail; the artist has put flecks of yellow to give the effect of gold thread on the sleeves, bodice front and sides of the skirt. (Arnold Queen Elizabeth’s Wardrobe Unlock’d 18). Details of the rich cloth, embroidery, and jewels “are so carefully rendered that they become a major focus of the portrait (Frye 51). So detailed is the painting, that it is possible to determine the materials used in the dress. Added to the striking color of the gown, the embroidery and embellishments are remarkable. “The gown, including the lining of the turned back sleeves, is of crimson cloth of gold damask” (Norris 287). The “‘workes’ may have been a cut velvet or deep red warp yarns against a lighter weft”** (Williams). Detailing a “bold linear design” the workes were probably of “material of a similar weave to a surviving fragment of silk in the Victoria and Albert Museum” (Arnold “The ‘Pictur’ of Elizabeth I When Princess” 303). Arnold speculates that the cloth was Italian-made. Such elaborate cloth was restricted to only royal use at the time. So according to Anna Reynolds, a curator for a previous exhibit at Buckingham Palace, In Fine Style: The Art of Tudor and Stuart Fashion, “young Elizabeth’s clothes are saying that she’s of royal blood” (Fullerton). Note that the “sleeves are cut very close-fitting at the top of the upper arm” (Norris 287). The conical shape created along with the long draping sleeves varies greatly with the more fitted style in Europe. Below is a near contemporary portrait by an artist from southern Europe along with the portrait understudy. Dramatically shown are the differences in the shape of the clothing and thus of the silhouette portrayed. Rounded and gathered, the Florentine depiction contrasts sharply with the triangular and straight style of England. pearls. Gems line her gown at the neckline, along the sleeves at the wrist, down the underskirt and amidst the gold embroidery throughout. Multiple necklaces, one with an elaborate pendant, the other disappearing into her bodice, surround her neck. While a further pendant is attached to her neckline, a bejeweled belt encircles her waist. Rings “on first, third and fourth fingers of the right hand, and on the first finger of left hand” draw attention to the beautiful, slender hands of which Elizabeth was so proud (O’Donoghue 1). Enlargement of the French hood. The jewels, fine fabrics and rich settings of the portrait obviously represents the presence of royalty. Additionally, Elizabeth I When a Princess portrays an intelligent and respectable young woman worthy of her place in society and the succession—just what Elizabeth intended. As Venetian Ambassador Giovanni Michiel commented, “she is a young woman, whose mind is considered no less excellent than her person” (Brown 884). ** Workes is a term used in descriptions of embroidery and weaving (Arnold Queen Elizabeth’s Wardrobe Unlock’d 376). Vol. 123, No. 938, pg. 302-304. 1981. JSTOR. Web. 14, July 2014. Arnold, Janet. Queen Elizabeth’s Wardrobe Unlock’d. Leeds: Maney, 1988. Print. Brimacombe, Peter. All The Queen’s Men: The World of Elizabeth I. Stroud, Gloucestershire: Sutton Publishing. 2000. Print. Dasent, John Roche, ed. Acts of the Privy Council of England, Volume 2 – 1547-1550. N.p. : n.p., 1890. Institute of Historical Research, University of London & History of Parliament Trust. British History Online. Web. 20. July 2014. <http://www.british-history.ac.uk/source.aspx?pubid=1177&sp=3&pg=86>. Davenport, Cyril. Miniatures: Ancient and Modern. Chicago: A. C. McClurg & Co., 1908. Google Books. Web. 5 July 2014. Elizabeth I When a Princess. Royal Collection Trust, 2014. Web. 13 July 2014.<http://www.royalcollection.org.uk/collection/404444/elizabeth-i-when-a-princess&gt;. Fullerton, Elizabeth. “Royal Flourish: A New Look at the Queen’s Collection.”ARTnews. ARTnews.com, 30 Oct. 2013. Web. 11 July 2014. <http://www.artnews.com/2013/10/30/royal-flourish-a-new-look-at-the-queens-collection/&gt;. Gaunt, William. Court Painting in England from Tudor to Victorian Times. London: Constable, 1980. Google Books. Web. 10 July 2014. Hearn, Karen. Dynasties: Painting in Tudor and Jacobean England 1530-1630. New York: Rizzoli, 1996. Print. “Henry VIII at Windsor Castle.” Henry VIII at Windsor Castle. (n.d.): n. pg. BBC Feature. BBC Corporation. Web. 10 July 2014. <http://www.bbc.co.uk/berkshire/features/henry_viii.pdf&gt;. Knight, Shannon. “The Self-Representation of Queen Elizabeth I”. ShannonKnight. WordPress, 15 Jan. 2014. Web. 12 July 2014. <http://shannonknight.net/?p=1774>. Mudd, Lindsay Jill. God’s Exceptional Queen: Elizabeth I’s Representation of Herself as the Virgin Queen. Ann Arbor, Michigan: ProQuest, UMI Dissertation Publishing, 2011. Google Books. Web. 2 July 2014. Norris, Herbert. Tudor Costume and Fashion. Mineola, New York: Dover Publications, Inc., 1997. Google Books. Web. 11 July 2014. O’Donoghue, Freeman. A Descriptive and Classified Catalogue of Portraits of Queen Elizabeth. London: Bernard Quaritch, 1894. Google Books. Web. 10 July 2014. “Portraits of Queen Elizabeth I.” National Portrait Gallery. National Portrait Gallery, n.d. Web. 7 July 2014. <http://www.npg.org.uk/business/publications/portraits-of-queen-elizabeth-i.php&gt;. Rutter, Carol Chillington. “Show Me Like a Queen: Elizabeth Among the Players.” Gloriana’s Rule: Literature, Religion and Power in the Age of Elizabeth. Ed. Rui Carvalho Homem and Fatima Vieira. Porto: Editora da Universidade do Porto, 2006. 61-82. Perspective Series. Google Books. Web. 12 July 2014. Strong, Roy. “Review: Reading the Portraits of Queen Elizabeth I.” Shakespeare Quarterly Vol. 42, No. 1, pg. 118-120. 1991. JSTOR. Web. 12 July 2014. “To Stay or Not to Stay: Two 1540s Portraits.” Renaissance Stays. Aneafiles.Webs.com, n.d. Web. 11 July 2014. <http://aneafiles.webs.com/renaissancegallery/stays.html&gt;. Watkins, Susan. The Public and Private Worlds of Elizabeth I. New York: Thames and Hudson, 1998. Print. Williams, Molly. “Tudor Dress.” Textile Matters. N.d. Web. 10 July 2014. 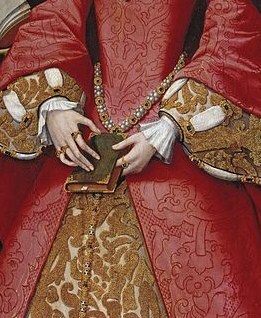 <http://textilematters.com/elizabethan-costume/>.